2. . In this regard, all Ministries / Departments are requested to advice all CPSEs under their respective jurisdiction to ensure that 10% reservation for EWSs as per the provisions of OM dated 19.01.2019 of DoPT would be effective in respect of all direct recruitment vacancies to be notified on or after 01. 02.2019 . 3. As clarified by DoPT in the OM dated 19.01.2019, the detailed instructions regarding operation of roster and procedure for implementation of EWSs reservation will be issued separately . 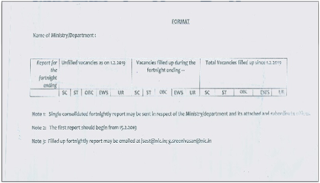 All administrative Ministries I Departments are also requested to submit Fortnightly Report in respect of CPSEs , beginning from 15.02.2019 , to DoPT as per format given in DoPT DO dated 21. 01.2019.